Vitamin B12 is important for many body processes, but if it’s in short supply the body won’t make as many red blood cells, they will be abnormally large and won’t last for as long as they should. If you don’t have enough red blood cells your tissues and organs may not get enough oxygen and this can lead to the symptoms of anaemia. The best way to avoid a deficiency and make sure you’re getting enough B12 is through eating a balanced diet. Holland and Barrett recommends six good sources of B12. These are beef, pork, eggs, milk, cheese and fish. If you’re vegetarian or vegan, it may be that you aren’t able to get enough B12 as you are excluding those food groups. In this case, B12 can be found in some breakfast cereals and nutritional yeasts. 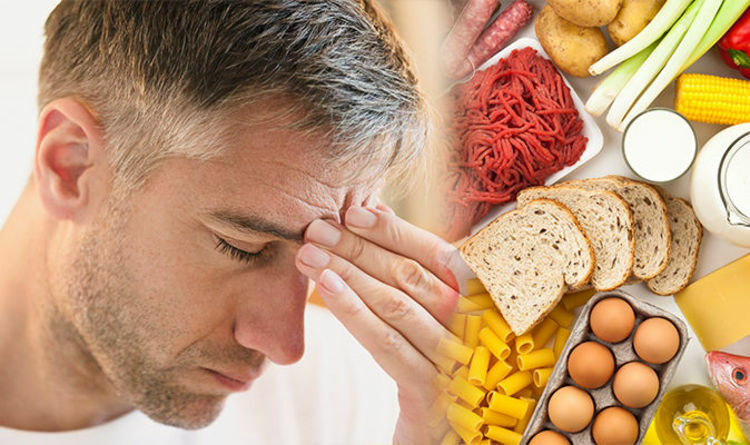 The symptoms of vitamin B12 deficiency anaemia, according to Bupa, include feeling very tired, breathlessness even after little exercise, heart palpitations, headaches, a reduced appetite, and a sore mouth and tongue. The health organisation adds: “If you have vitamin B12-deficiency may cause symptoms related to your nerves. This is called vitamin B12 neuropathy. “It may affect your movement and sensation, especially in your legs, cause numbness or pins and needles and decrease your sensitivity to touch, vibration or pain. It can also cause confusion, depression, poor concentration ad forgetfulness. People with vitamin B12 deficiency anaemia may be treated by their doctor though diet changes such as these, but also injections of vitamin B12. Nutritionist Dr Josh Axe recommends taking vitamin B12 supplements to help prevent deficiency symptoms. On his site it states: “A vitamin B12 deficiency is thought to be one of the leading nutrient deficiencies in the world. “Vitamin B12 benefits your mood, energy level, memory, heart, skin, hair, digestion and more. “Because of its wide-reaching roles within the body, a vitamin B12 deficiency can show up in many different negative symptoms, many of which are very noticeable, such as potential chronic fatigue, mood disorders like depression, and chronic stress or feeling run down. “Vitamin B12 can be taken in tablet form, in drops that you place under on the tongue or in oral spray form. Iron is another mineral vital for healthy function of the body. Iron deficiency anaemia, its full name, is caused by lack of iron. This in turn causes a lack of adequate healthy red blood cells in the body. It’s usually treated with iron tablets prescribed by a GP and by eating iron-rich foods – but how can you recognise if you have an iron deficiency in the first place? First Creed 2 Trailer Shows A Muscle-Bound Michael B. Jordan Getting Back Into The Ring Ariana Grande The Light Is Coming: What is the sample of a man shouting in new song?